What Could He Say About Cricket? It was no surprise to the assembled and aging audience that Alan Castel selected himself to open the post lunch story session, “Fellow Athletes …” he began. “Anyone under the age of 65 may as well leave now.” No-one moved. For a decade Castel, the last English-born leg spinner to play for Hampshire was the club’s Lord of Misrule – the permanent irritant in the otherwise measured life of that urbane County Secretary and former Captain, Desmond Eager. 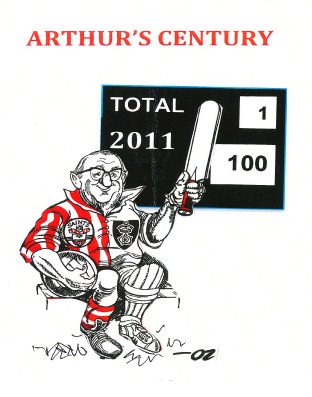 Authority was to ‘Cas’ as a red rag is to a bull and this cricketing roustabout spent as much time outside the door of Eager’s office awaiting admonishment as ‘The Fat Owl of the Remove’ spent outside Quelch’s study awaiting the cane. Floreat Hampshire! With Danny Livingstone he held and for that matter may still hold the county’s ninth wicket 230 run record partnership. In 122 first class matches he took 5 wickets in an innings eight times but was never capped, an injustice remedied later in the day when the current Chairman Rod Bransgrove presented him with Holty’s County Cap forty years on. Eager could be heard spinning in his grave. In Arthur’s day there was just the one man to do it all. 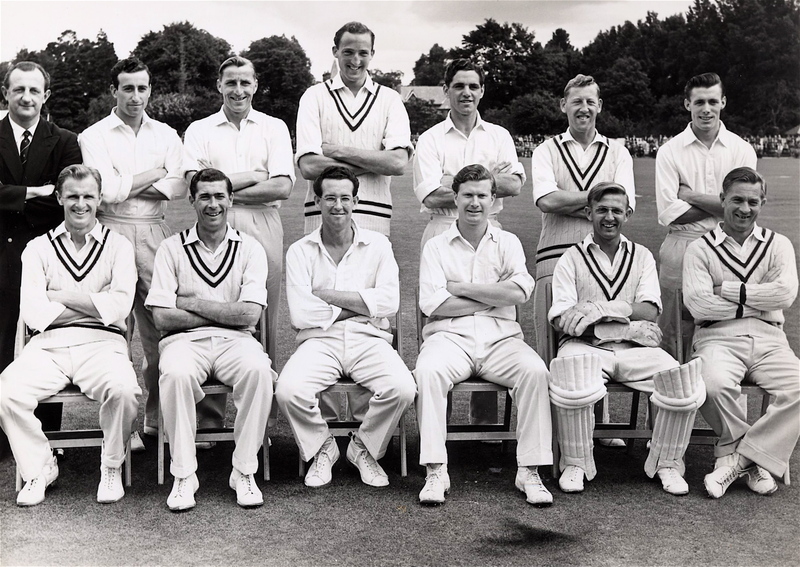 Second into bat was Keith Wheatley who told the assembled of his first match for the Second XI against Sussex at Southampton possibly in 1965. In the fourth and final innings Hampshire needed 140 to win. He entered the fray at 65 for 3 and proceeded to glove one to the wicket keeper. He was so dismayed that he simply ‘froze’. The umpire, a pre-war cricketer who no doubt had served in the artillery and was as deaf as a post and as blind as a bat, gave him not out. He sallied on and despite the pre-sledging but incisive invective of his opponents scored 50 to help guide the IIs to victory. At the top of the rickety steps to the wooden shack-on-stilts that did for the First Team dressing room at the old County Ground, “Coach” was waiting for him. Cricket when played in the right spirit there is no sport more capable of developing man’s finest qualities. In no other game is the individual and his team more closely integrated that one man alone may win you a match not necessarily by technical skill, but by intelligence CONCENTRATION and CHARACTER and one man can loose you a game by the failure of one of those qualities. To play it keenly, generously, honourably and self sacrificially is a moral lesson in itself, and the classroom is God’s fresh air and sunshine. The game may now have reverse swing and reverse sweeps but that is not all that has been reversed since Arthur played and coached and communicated to talented young cricketers how the game should be played. “Alas,” does Third Man hear you say? N.B. The pieces on Arthur Holt began three posts ago here with Would You Like to Join the Nursery Staff? The Squire has been acting most oddly of late. Yes, even more oddly. He is spending less time with the village blacksmith on time machines; which, as his lordship’s preferred ‘test pilot’ Third Man is relieved at; but instead retreating to his game room where, on a very large table, he has taken to modelling and remodelling a strange white bowl-like construction on top of a pile of earth that he has had brought in by the gardeners. The whole is topped by miniature tented structures. He has been labouring on this night and day for a number of weeks. Elsewhere in the village, farm labourers have been behaving oddly too. There have been reports of bright lights in the hours of darkness. Some have taken to staying up all night watching the sky for ‘signs’. The vicar has erected a pile of hymnals in the chancel that looks vaguely similar to the Squire’s metal, mud and canvas creation. Miss Prim, who has never been quite the same since the visit to the Great House by Lord Byron, is painting again. She calls the series ‘Dreams of Far Pavilions’. She has kindly allowed Third Man to publish No 23 of the Series above. Matters intensified last Thursday when Third Man ‘drove’ the Squire in the brougham to Botleigh Grange where, after diner, fellow guests Rodney Bransgrove Esquire, his great architect and civil engineer EPR and some coves from the successors to the White Conduit Club used the billiard table to lay out the latest master plans for Mr Bransgrove’s cricket ground which is set to be the first to achieve England and Wales Cricket Board’s TSF(2) ‘model ground’ status qualifying it to stage a Test match in June this year. No wonder the Powers That Be are nervously monitoring every milestone and hurdle along the way. After a relaxing overnight sojourn at the Grange, the Squire insisted Third Man drive him to the site of the venture. So great were the numbers attracted there, each person no doubt driven by a similar vision, and so disruptive the work going on, that the brougham had to be parked in a common meadow. 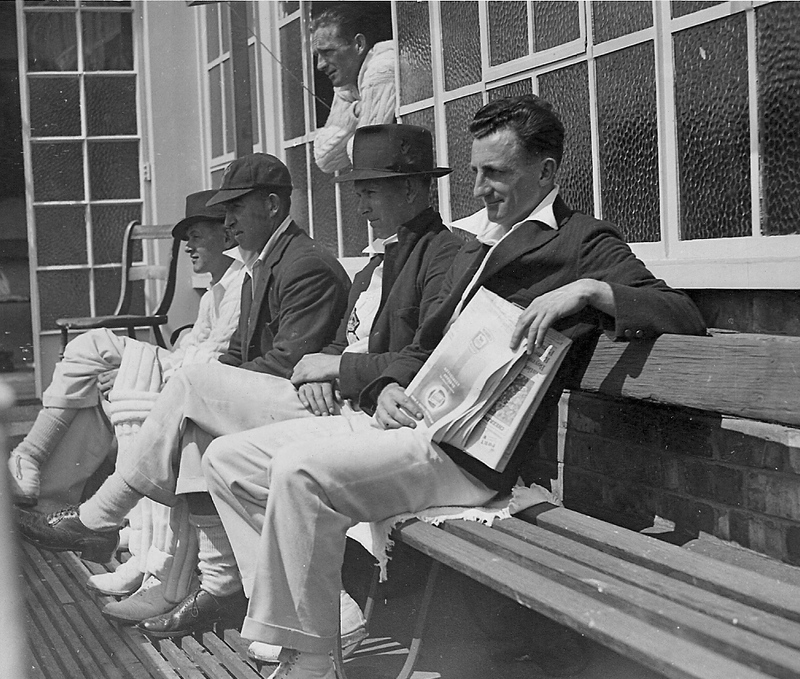 They joined the stream of humanity who were keen to witness the first day of the season, carrying their provisions for the day in a variety of much used bags and napsacks, and climbed the steep rise to where Bransgrove has encouraged Hampshire CCC to relocate. It was at this point that Third Man both realised that in reality they were mounting the Squire’s erection (that could have been better expressed but Third Man is short of time) and glimpsing Miss Prim’s Far Pavilions, for, on top of the hill there came into view a perfect white creation largely of metal and glass shining in the April morning sunshine. Rather like Nyren’s commercial venture on Broadhalfpenny Down two hundred and fifty years ago, the ground is situated far from the traditional commercial market place on a piece of cheap ground to which those in search of cricket must make their way as best they can. Like Nyren’s enterprise The Rose Bowl as it is called is shrewdly situated close to the junction of two great highways, the M27 and the M3 and, attended as it is by hotels, leisure centres, supermarkets and shopping malls, there are close structural parallels to the Cradle of Cricket. Plus ca change. The tide of common humanity was shepherded rather briskly by uniformed guardians intent on keeping it from the hospitality areas (as Nyren’s staff had kept the riff-raff from the Quality entertained in the seclusion of The Lodge). However, the Squire seemed to be recognized and he and TM were taken by the elbows and shown to the Shane Warne Suite. How Richard Nyren, that tenant of the Bat and Ball, would have admired the entrepreneurial flare on show. Although it would not have been lost on him that the capacity crowd that might in June gather here to watch the Sri Lankans play All England would not be much more than he commonly entertained a few leagues away on the Down above Hambledon. Our ‘suite’ was laid out for a fine banquet. 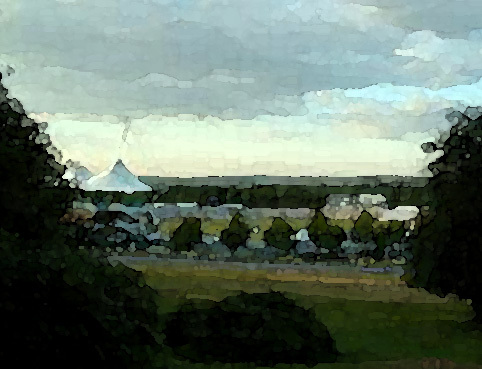 To the left through a long wall of windows and opening doors a seating area afforded a dizzy view of the majestic stadium amid its fine landscape of Hampshire farmland. It was as if a huge white and gleaming docking station had been constructed for the arrival of some space ship from the other side of the Milky Way surrounded by all the necessary facilities to entertain, amuse and educate our visiting aliens in the ways of C21st mankind. Then, as the players of the modern era took the field below (Durham had won the toss and would bat) from the end of the Shane Warne Suite long forgotten cricketers last glimpsed in the ‘60s re-emerged into the present, perfectly preserved. Persevered, you understand culturally though not physically, for space travel near the speed of light may frustrate time but it cannot prevent a toll being taken on waist and hairlines. Here, to celebrate the one hundreth anniversary of the birth of their Coach and lodestar, Arthur Holt, were some of those who played cricket in that unique period as the austere years of the ‘50s and early ‘60s awakened into the Swinging Sixties and headed unwittingly towards the Packer Earthquake, the aftershocks of which could still be felt below us on the field of play where Durham, no longer a new and custom breaking Test Match county made 413 in 96 overs. By the close of play at 6.30 in the mid-Sixties our veterans would have bowled 120 overs and Hampshire’s first innings would have been under way. The only ice in sight, would have cooled the Committee men’s gin and tonic. * In Stephen Spielberg’s 1977 classic film Close Encounters of the Third Kind (CE3K) an up-surge in UFO activity and the communication from space of a specific set of co-ordinates prompts experts under the auspices of the UN to prepare a secret landing zone for the UFOs and their occupants at Devil’s Tower, Wyoming, to which are drawn civilians who have been affected by the recent alien contact. The military endeavour to turn these folk back. An enormous mother ship lands at the site and people who had been abducted over the years return home out of the bowels of the craft. Would You Like to Join the Nursery Staff? No, Down At Third Man has not started to take Google adverts and this is not an invitation to join an NVQ course in Child Care, so it’s safe for you to read on. “Who he?” TM hears you ask. Arthur was a Saint. In fact he was a Saint twice over. He was a fine footballer for Southampton with a powerful dead-ball kick, with a little bow-leggedness left over from the experience as football pros often had in those days when stretching was confined to storytelling. But he was also a Saint on, off and around the cricket fields, nets and pavillions of Hampshire and beyond where his friends were numerous and their friendships lasting, deep and affectionate. He was a natural story teller and cricket, with its characters and life on the road, was a treasure trove awaiting his ever so slightly mischievous interpretations of events. 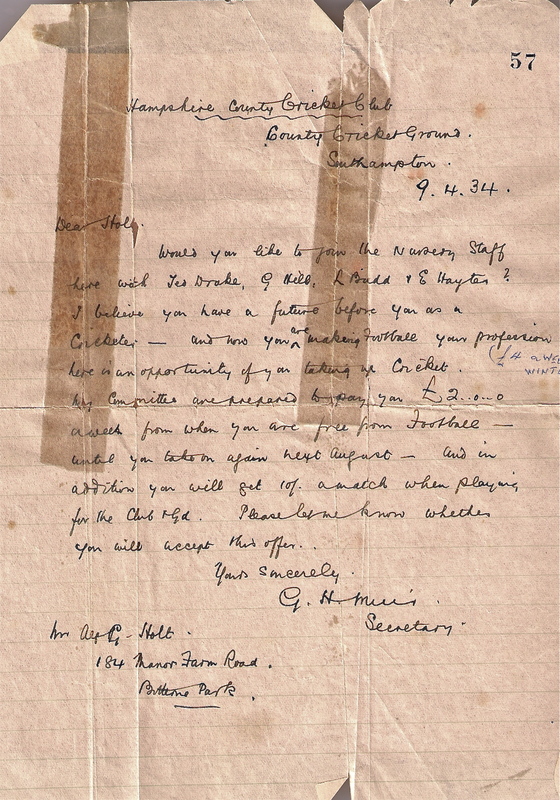 At Hampshire Cricket History and now below you can read the letter sent by the then County Secretary inviting Arthur to join the Ground Staff. At his death, Arthur's collection of memorabilia, including this letter, passed into the safe keeping of Peter Haslop, a Holt Colt, who in turn has made them available to Dave Allen the Hon. Hampshire Archivist who is assembling a wonderful collection off treasures, which may soon have a home at the Rose Bowl. Thankfully for Hampshire but also for a number of young cricketers not then born he did so, because after his 79 match playing career either side of WWII, Arthur moved naturally into coaching and developed, as the County Coach, a string of fine players in the late ‘50s and ‘60s, most notably Peter Sainsbury, Bob Cottam and Trevor Jesty. Dave Allen’s blog has photographs of a number of ‘his’ teams including the Championship Side of 1961. When the manager of the Under 15s Hants Schools side saw an extraordinary innings by a youngster from Berkshire, wearing one pad and no gloves, he was on the phone immediately to Arthur and a contract was taken round as a matter of some urgency to a Mrs Greenidge of Reading. Gordon’s earliest matches at Hampshire were with Holt’s Colts as the County Colts were called and his batting style owed much to Arthur’s classical style allied to free expression – as did that other wonderful driver and fierce puller, Trevor Jesty, in whom you probably would have seen the full expression of the Holt cricketing manual. This was the way Hampshire batted – the Holt way. No wonder it was such a home from home for the likes of Roy Marshall and Barry Richards. Now batting is all about expressing ‘oneself’. Then, Arthur, in advocating such an approach, was almost a lone voice. Happy Hants was not the sole creation of A.C.D. I-M. whose genius was to give his side permission to follow ‘Coach’ Holt. But his influence was considerable outside of Hampshire. He was a frequent visitor to Lilleshall where he coached the coaches and so his approach to cricket, and especially to batting, was spread through the game, often against the prevailing current of caution and limitation. For those young cricketers whom he guided and for whom he opened up the great vista of their own skill, he enjoyed their successes and sustained them with his deep and genuine affection when things did not go quite so well, as is often the way with bloody cricket. When his sports shop in Shirley had closed for the day he would frequently make his way down to the old County Ground at Northlands. He might have a bat that he’d repaired under his arm as an excuse, but his real purpose was to have a quiet look at one of his protégés, however old and seasoned they might be. 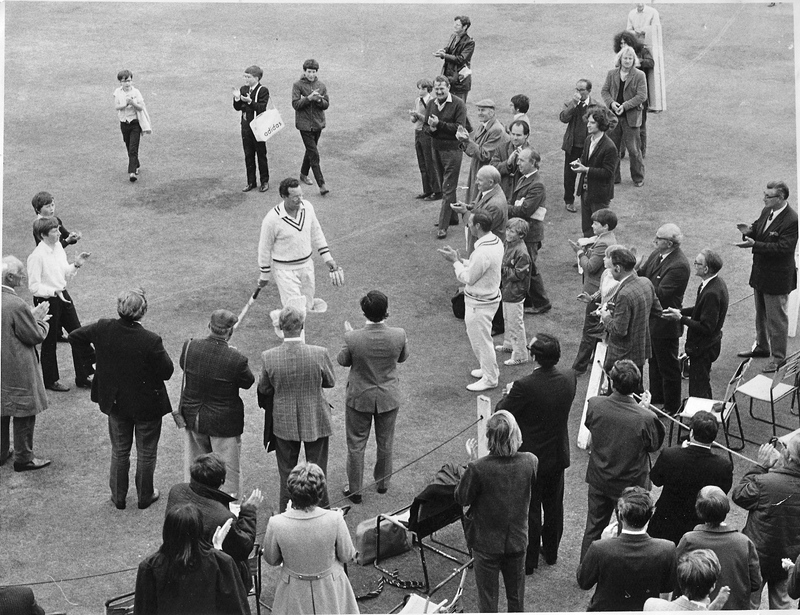 So it is not surprising to glimpse him centre right in the photograph below applauding Roy Marshall as he carried his bat off the field for Hampshire for the last time in 1972. His respect for a great cricketer is palpable in this tiny fragment of the image. That’s what coaches did. Always keeping an eye on your game. He’ll probably be there tomorrow. Dear Arthur, Hampshire are playing Durham, yes Durham, at a place called The Rose Bowl. Somewhere near Botley. Would you believe it? Hover close and hear some of your stories. Best. TM. For those who cannot wait for the start of the Perth Test here is some film of the 1948 Lord’s Test, England v The Invincibles. Dave Allen has been in touch with Third Man to share a gem of a discovery. A British Council Film, Cricket (1948). Narration by Richardson (Ralph) and Arlott, sounding a little like Bond, James Bond, even down to chain smoking Chesterfields. It’s subject? 22 yards, 4 rods, poles and perches, 1 chain. It is more than just a few glimpses of Bradman batting, Hutton fielding, Compton on a ‘sticky’ and bucking, bridling Bill O’Reilly. It is Unmitigated England. A celebration of ‘wistful yearnings never quite fulfilled’. Bat and ball making. A homage to cricketers of long ago. 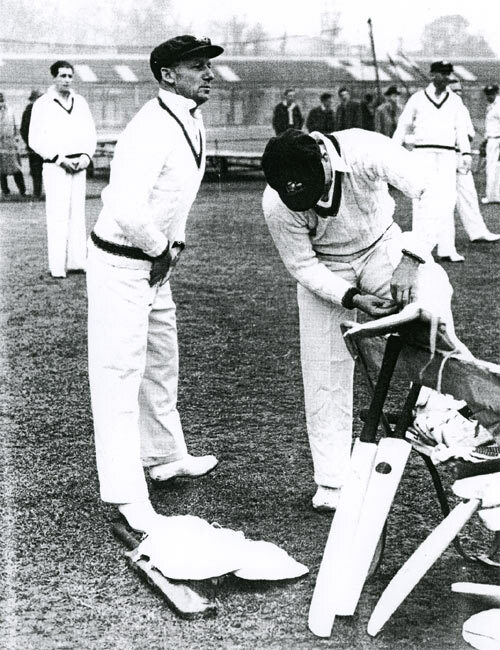 A glimpse of coaching at the old County Ground in Southampton where Third Man’s coach, Arthur Holt, is seen as a very young man doing what he did best. Where else would Arlott take the cameraman? It is all a long way from Perth, December 2010. Australia win by hundreds. Watch it here, all 17 glorious minutes of it.